So here’s the first ever review…. 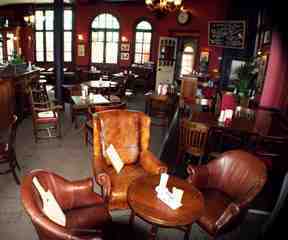 The White Hart is about 2 minutes walk from Barnes Bridge station alongside the Thames. First impressions weren’t particularly overwhelming and upon walking through the door it appeared to be deserted apart from a scattering of locals and a family with two borderline ADHD children. Bar staff were friendly enough though were dressed like they were going to watch ‘the ruggers’ and were talking football nonsense with the obligatory early Saturday regulars. Hitting the first pint with my brother fellow pub aficionado Sam a round set us back a fairly standard £7.50, opting for Young’s special chosen from a rather humble three beer selection. Generally this place felt a bit crap. It’s in an incredible spot for watching the river and the Oxbridge boat race passes by but it’s tired and drab and trying to be something it’s not. It’s lost in a limbo between being a cozy boozer and a football pub for the ‘hooray Henry’ crowd. It’s notching up a worrying 3 plasma TV’s and a chalk sign in the lav decrees ‘its all about the 6 nations at 3’. Sadly for us it was all about sodding off to another pub. Overall score was 8/20 though it might do better on a bright Summers day rather than a grizzly and dreary Saturday in February. Next! !